In a wing of the Château Gourdan are three accomodations in an exceptional location. This home is suitable for four to six people. Tenants have full access to the magnificent gardens surrounding the Château: French gardens, splendid lawns, an Orangerie, and the wonderful heated pool that is beautifully and colourfully lit at night. 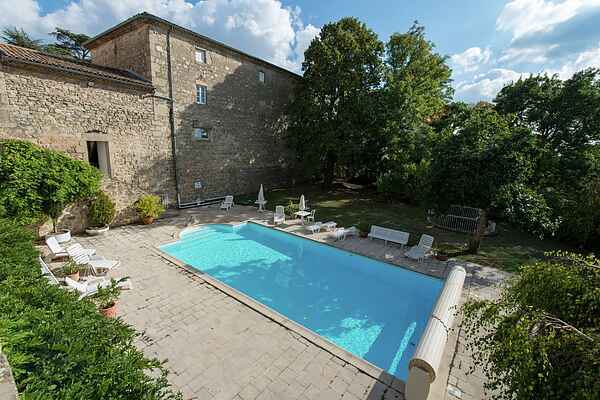 It is right in front of your castle wing and is surrounded bij a spacious sun terrace (with seats and loungers) and lovely lawns. The ground floor of the wing is for communal use too. This lovely space, with its high arched ceiling, comes with a very comfortable couch, an American billiards table, ping-pong table and table football, a freezer, a sunroom and a laundry room with a washing machine. The wing dates from the 19th century, and has recently been renovated. You can reach every home via your own staircase leading to a small terrace. The interior is exceptionally beautiful, neatly kept and very attractive. It is located just above famous Annonay, fifteen minutes from the motorway (autoroute). The Château dates from the 16th/18th century and is privately owned. It is not open to public; however occasionally weddings take place on Saturdays. You can then bump into newlyweds posing for pictures in the park.